All purpose flour: 2 Cups + More. In a large bowl add flour. Make a hole at the middle.Add milk, egg, oil and salt to taste.Mix it well and make a smooth and elastic dough. Add water or flour to adjust consistency. Depending on air humidity, you might need to add some more flour. 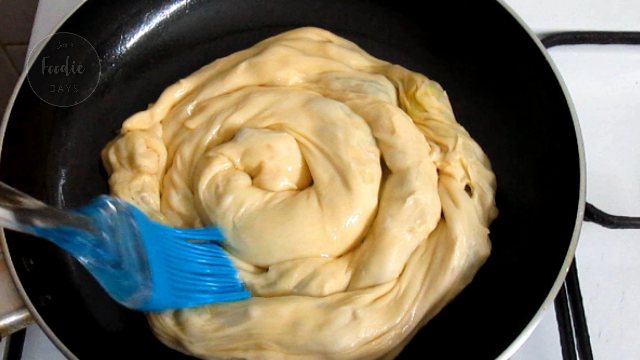 The dough should look similar to pizza dough. Cover it with a plastic wrap and set aside for 30 minutes to 1 hour. Add red chilli flakes, coriander leaves and salt to taste. Combine well. The filling is ready and allow it to cool. Divide the dough into 6 equal sized balls. Place the ball in the slightly oiled work surface. Apply butter or margarine. 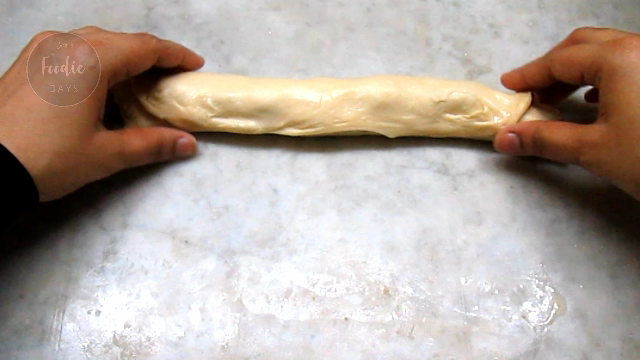 Stretch the dough and make a large thin sheet. 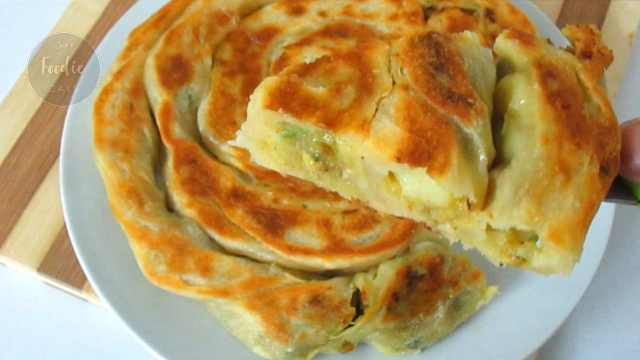 Add the prepared filling as shown in the below picture. Brush with egg mixture on the surface.Roll it into a long and thin log.Repeat the process for the remaining dough and filling. Apply oil to the surface of the pan.Coil the small individual rolls into a swirl. second roll continue where the other roll had ended. Third roll - continue where the second roll had ended.Brush little oil to the surface. Cover and cook on low flame for 15 minutes.Turn it over and cook for another 15 minutes. or egg wash the surface of pastry and bake in a preheated oven at 190 degree celcius for 35 to 45 minutes or until the top and base are crisp and golden. Cut into pieces and enjoy..